I haven’t spoken on our PyDataLondon meetup community in a while so I figure a few numbers are due. We’re now at an incredible 7,800 members and just this month we had 200 members in the room at AHL’s new venue. We’re a volunteer run community – you’ll see the list of our brilliant volunteers here along with their Twitter accounts. I polled the attendees this month and 1/3 of the hands went up (see below) to the question “Who is a first-timer to this meetup?”. This shows the continued growth in our community and in the wider data science ecosystem in London. Welcome along! One of our talks was on Pandas v1, that included an update by Marc on how Python 2.x is being deprecated in Pandas next year and the new Cyberpandas and Fletcher (dtype extensions including faster strings) libraries. Marc also noted that Pandas is estimated to have 5-10 million users! One of the benefits of internal Pandas updates will be the “UInt8” and related dtypes – we’ll have integers with NaNs for the first time ever (previously int arrays with NaNs were promoted to floats which have NaN support in numpy). Given the continued growth of our ecosystem – this means we have more Python newbies and more Data Science newbies (including converts moving away from Excel and SPSS). We’re always looking for new speakers. New speakers don’t have to be experienced data scientists – a 5 minute lightning talk on how you are transitioning in to this ecosystem from elsewhere can be hugely valuable to other new members. A talk (5 mins or 30 minutes) on a technique you’re experienced in – even if there’s no equivalent Python library – is also incredibly educational. Please come and share your knowledge. Talking will raise your profile and it’ll raise your employer’s profile (if that’s what you’re after) and that obviously helps with hiring. We continue after the meetup in the local pub (typically The Banker) so anyone who’s been speaking and who ends with “and we’re hiring!” tends to have interesting conversations in the pub afterwards. With 200 attendees it isn’t hard to find folk who’d be interested in your role. Remember – this is most effective for speakers as you have the entire audience’s attention. You’ll find instructions here on how to submit a talk. 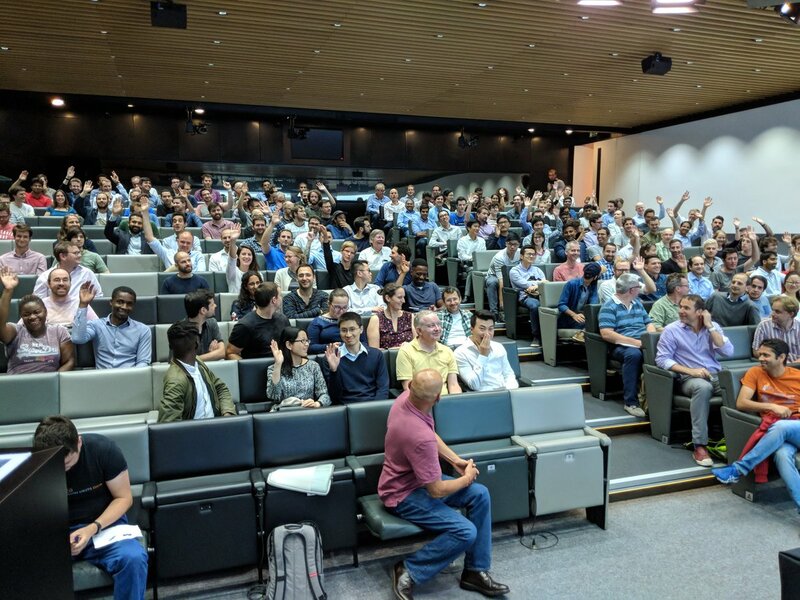 AHL continue to support our open source PyData world (along with other open events like the London Machine Learning meetup), they now rent a professional auditorium next to their building each month for us with full hosting, mics on every chair and video recording (see them at PyDataTV) for speakers who consent. This isn’t cheap of course and it provides evidence of the growth of Python’s Data Science stack in the London financial community. AHL’s activity at the meetup is to say a few words before the break about who they’re hiring for, before everyone heads out for more beer. Thanks AHL for your continued support! You might also want to check their github repo. There’s a whole pile of PyData conferences coming up, you might find some are closer to you or your offices than you imagine. Go check the list. The PyData meetup ecosystem has grown world-wide to 111 events now too! PyData of course is supported by NumFOCUS, the non-profit in the US. NumFOCUS backs a lot of our open source tools. They’re having a summit late this September in the US – everyone is welcome, if you’re interested in the deeper direction of Python and the Data Science community then you might want to attend (or send a representative from your group?). Of course you might also want to be hired by a company that works in our PyData ecosystem. I post out jobs (UK-centric but they stretch to western Europe and sometimes to the US) every 2 weeks to 650+ data scientists and engineers, typically 7 roles (mostly permie, some contract, all Python focused). You might want to join that list (note your email is always kept private and is never shared). Attending PyData members (i.e. anyone who helps build our ecosystem) gets a first post gratis. Ian applies Data Science as an AI/Data Scientist for companies in ModelInsight and in his Mor Consulting, sign-up for Data Science tutorials in London. He also founded the image and text annotation API Annotate.io, lives in London and is a consumer of fine coffees.